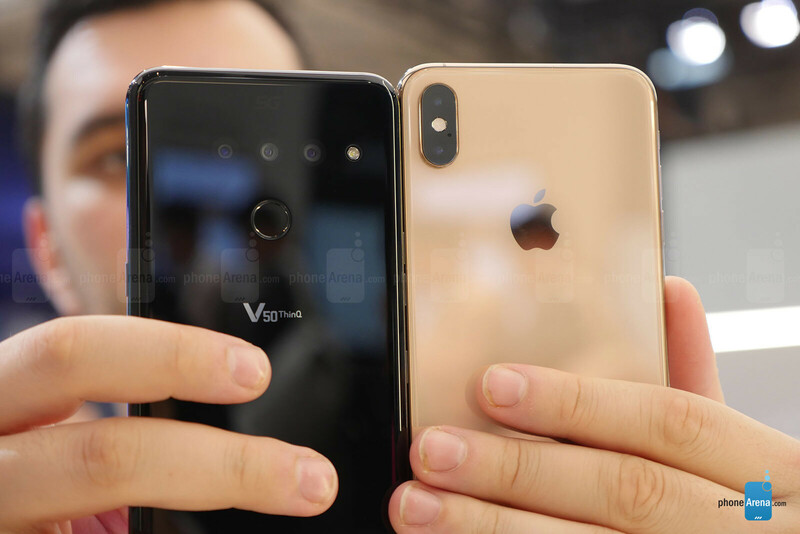 LG G8 and LG V50 versus the iPhone XS Max: first look! Alright, so the MWC heavy-hitters are here and, among them, we have the LG G8 and LG V50. Yep, LG dropped both new models at once, no 6-month wait window between them like before. 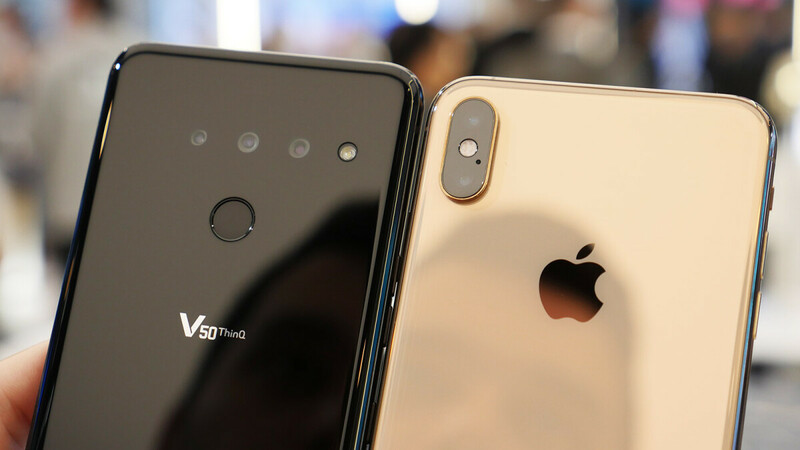 And they are quite similar, with the small exception that the G8 has a ToF camera on the front, while the V50 has a wide-angle selfie camera and a telephoto camera on the back. That said, we decided to take a look at how these two phones stack up against the competition. 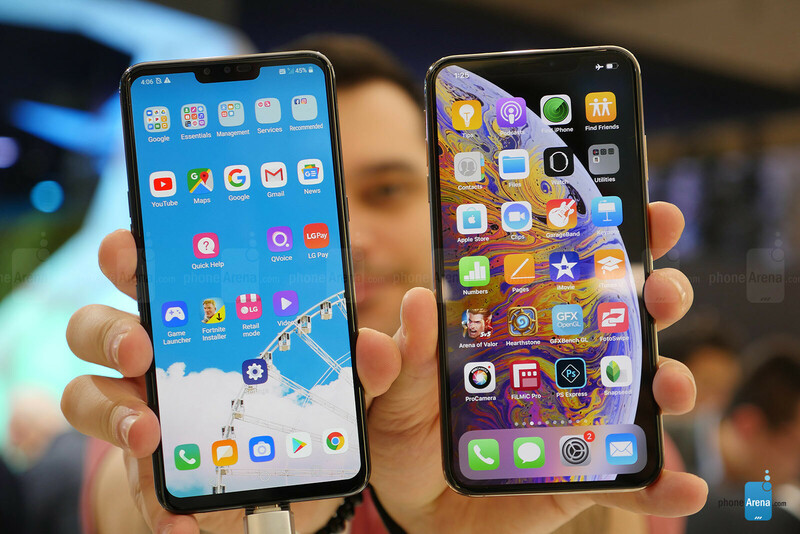 Here, we'll be taking a look at the LG G8 and LG V50 versus the iPhone XS Max. All of our contenders sport OLED panels up front, with deep blacks and vibrant colors typical for the tech. 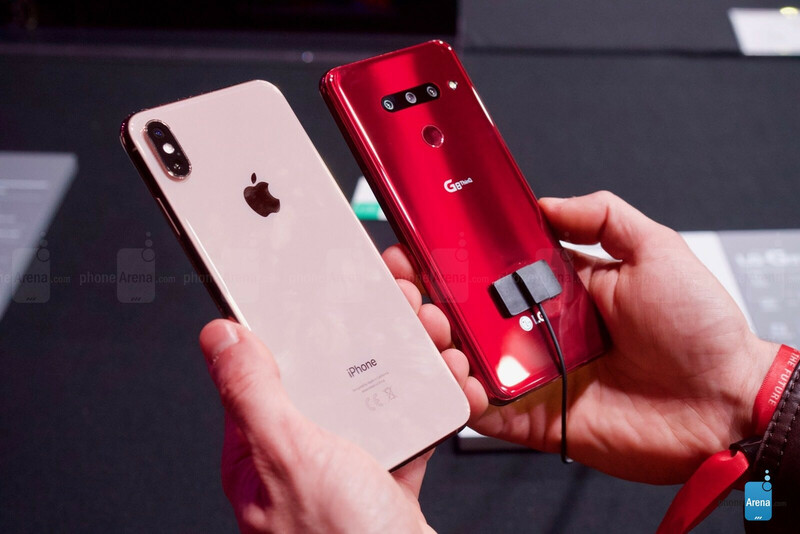 The G8 ThinQ has a 6.1-inch diagonal, the V50 is pinned at 6.4 inches, and the iPhone XS Max has a 6.5-inch screen. All of them have a 19.5:9 aspect ratio, so they are directly comparable. Having said that, the iPhone XS Max has the largest display of all three, obviously. 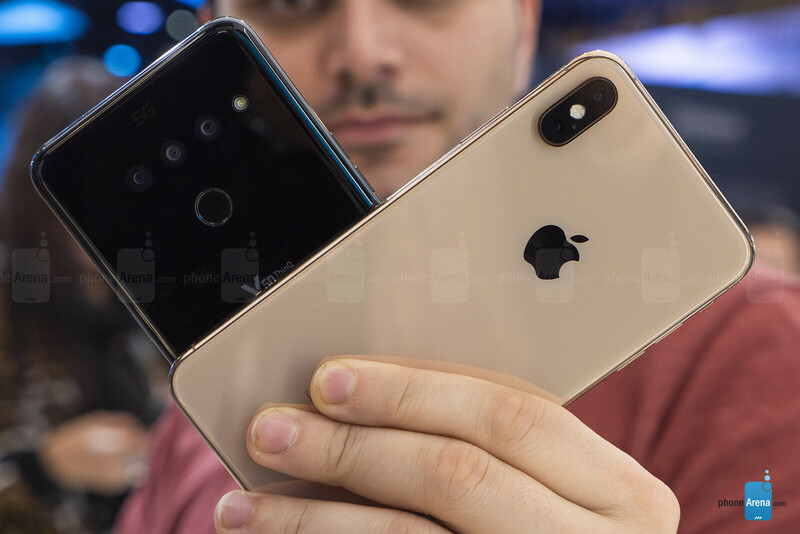 As far as sharpness goes, all three offer a pretty crisp image, with the LG G8 having 563 pixels per inch, the V50 offering 537 ppi, and the iPhone XS Max — 458 ppi. All three have that controversial notch on top of the display, so no losers here, but there's a special feature, which might win LG some bonus points from long-time fans — both the LG G8 and LG V50 still have their headphone jacks. As far as pristine design goes — each of these phones has their strengths and weaknesses. The iPhone's all-around uniform bezel makes for an extremely polished look up front, while the G8 and V50 still have a bit of a chin on them. On the flip side, the LG phones have absolutely no camera bumps, while the iPhone sports that small chimney-like module. Still, it's hard to beat the feel of the iPhone XS Max' stainless steel frame; the LG phones still have an aluminum trim. All in all, we feel like the iPhone has a bit more "oomph" in the design department, but the LG phones both look and feel pretty great in their own right. Add to that the benefit of a 3.5 mm jack and the complete lack of an annoying camera bump and we can see why some people might veer towards the G8 or V50. Now, we have some very different beasts here. The G8 and V50 run on Google's Android operating system and sport the best hardware LG could get from a 3rd party manufacturer. Apple's iPhones are powered by a home-designed processor and run on a homemade operating system, which is iOS. In any case, each phone has the latest-and-greatest of its respective type of hardware. LG's phones rock the octa-core, 2,84 GHz Snapdragon 855, Apple's iPhone XS Max hums with the hexa-core, 2,49 GHz A12 Bionic chip. The latter has been a champ in the benchmark game up until now, but some early reports suggest that the Snapdragon 855 might be a worthy challenger to it. In any case, we felt that the LG V50 and LG G8 ran pretty smooth in their own right. They come with Android 9 Pie out of the box with LG's customized user interface laid on top. It has felt like a mature operating system for a couple of years now and, no surprises here, it still does with the new phones. We've still got themes, custom icon selection, a choice whether to have an app drawer or not, different screen calibration settings, and many other options. As for the iPhone — iOS is iOS. It's a bit limited when it comes to customization, there's no app drawer, no themes, and not a lot to tweak about it. But, then again, it hardly needs much tweaking, as it runs extremely well. The power of home-grown hardware and software is evident here. If updates are what matters to you — the iPhone will be getting new builds of iOS for years to come and at release date. As for the LG phones — update schedules are shaky at best. And, even though LG has opened a Software Upgrade center back in 2018, we still haven't seen any direct results from that investment. Apple has had a stereo speaker system in its iPhones since the iPhone 7. The bottom-firing driver is rich on lows and mids, while the earpiece is used as a tweeter. So, it's sort of a weird mix between a 2-channel Hi-Fi and actual stereo, but nevertheless, if you turn the phone sideways, you get a left - right channel split. And the iPhone XS Max is one of the best-sounding phones we've heard thus far. Loud, meaty, yet clear. LG kept away from the stereo trend and last year introduced its own Boombox speaker — the G7 and the V40 still only had one driver at the bottom, but the entire phones were designed in such a way that they would cause any surface you lay them on to resonate. So, placing the G7 on a wooden table instantly enhanced its sound. The LG G8 is a weird beast that sort of gets a mix of everything. Now, first of all, the G8 does not have an earpiece. 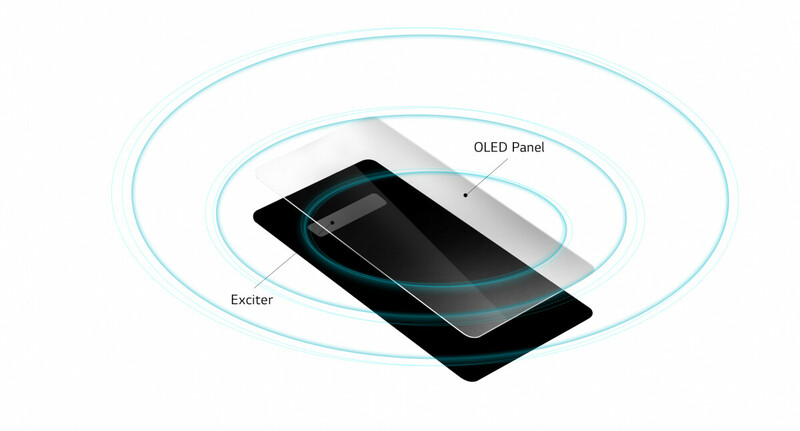 Instead, the top half of the OLED screen vibrates and transfers sound into your ear while in a call. That same portion of the display will vibrate and give off sound when you are listening to music or watching a clip on the phone. And the G8 still has the Boombox speaker on the bottom. So, we have a really interesting result here, giving us a nice and full sound, especially if you can find the right surface to lay the G8 on. As far as the LG V50 — it's still stuck in 2018. No stereo speaker, no vibrating OLED. It has the mono Boombox on the bottom and a standard earpiece up top that's only used for calls. So, in the category of sound, we guess the V50 is at the bottom. The LG G8 ThinQ sports a shiny new module on the front, which LG calls "Z Camera". It's a Time of Flight camera, which basically creates complex 3D depth maps of whatever object is in front of it. So, LG used it for its own version of advanced face-unlocking. It shouldn't be affected by light conditions like it is in many other phones. We got to test it in the hands-on booth and it worked pretty fine for us. But we haven't had the chance to put it through a ton of different scenarios yet. The iPhone XS Max has Apple's Face ID, which also creates a complete map of your face. Face ID has been available since the iPhone X and we've had plenty of experience with it. It's an excellent unlocking feature, which can recognize us in the dark, with hats, changed facial hair style, et cetera. We hope that the Z Camera would perform the same, but can't confirm as of yet. But here's the kicker — the Z Camera isn't used only for face unlock. It can also read the veins of your palm. That's right, you can register your unique palm with the LG and unlock your phone by just waving in front of it. There are also some gesture shortcuts, which allow you to switch between apps and toggles without touching the phone. Gimmicky? Probably... Useful when your hands are dirty or wet? Definitely. We'll have to play with this a bit more! Another thing that the iPhone lacks is a fingerprint scanner. LG stayed true to their design and still included a fingerprint scanner on the backs of both its phones, where your index finger naturally rests. So, if you are into this "old school" method of unlocking, LG has your back... on its phone's back. Eh, you get it. The showfloor at MWC is hardly the place to make extensive camera shootouts. Also, the software running on the demo LG phones may or may not be the final version that's going to be on the retail devices. So, we'll withhold A-B comparisons until we get our hands on retail versions of the LG phones. All three phones have a Portrait Mode feature — yes, even the G8, despite its lack of a telephoto lens. But the two LGs have the benefit of sporting a wide-angle lens for action camera-like shots. 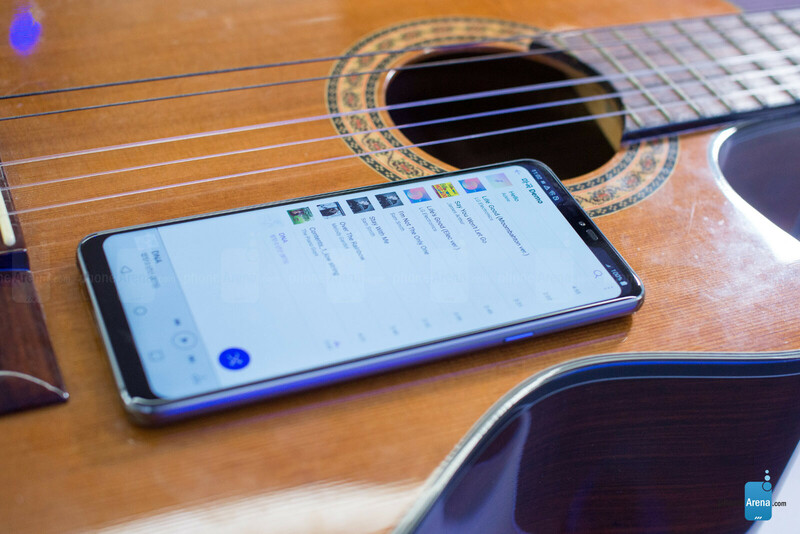 LG's phones actually take it up a notch by offering the brand-new Video Portrait mode — you can get a virtualized bokeh effect like we've seen on Portrait Mode before... but this time on live video! Again, we'd love to put this feature through its paces once we get the final version of the devices. It's pretty hard to keep an exact score when stacking these phones against one another when we don't know the exact pricing of the LG G8 ThinQ and LG V50 ThinQ just yet. However, we feel like the G8 is going to get a lot of traction this year. Or at least it'll get more interest than the LG V50. The latter feels like a beefed up V40 with a 5G modem. And tech fans usually don't like recycles phones. Considering that 5G is not widely available yet — we don't really expect the V50 to make a killing. Yeah, sure, it has that secondary screen case accessory, though, its appeal is questionable. The G8, on the other hand, has some cool or weird new features. Some of them might be gimmicky, some of them might be useful. We really liked the concept behind the air gesture controls, though, we wouldn't say they worked super-smooth for us on the demo unit. But here's hoping that the Z Camera gets better. The lack of an earpiece and the completely smooth glass over the camera module just adds an element of subtle elegance that we'd say we really enjoy. 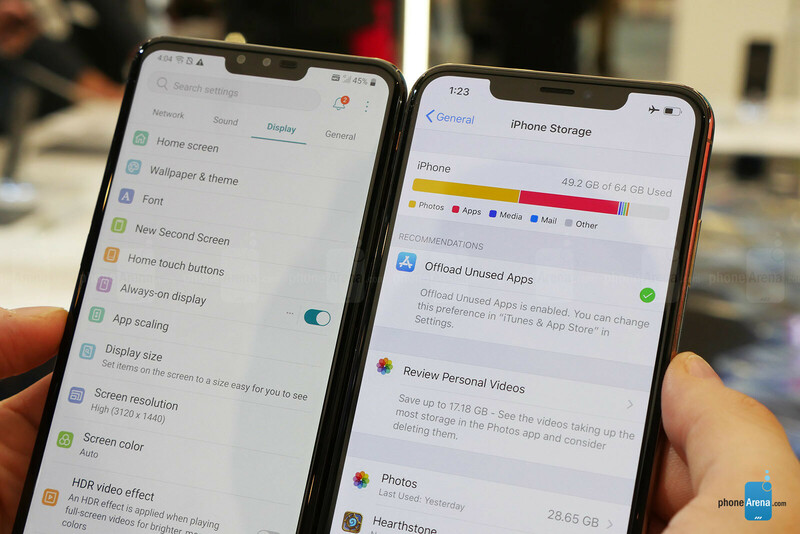 We don't feel like any of these two handsets have the power to pull an iPhone XS Max fan away from their device of choice. 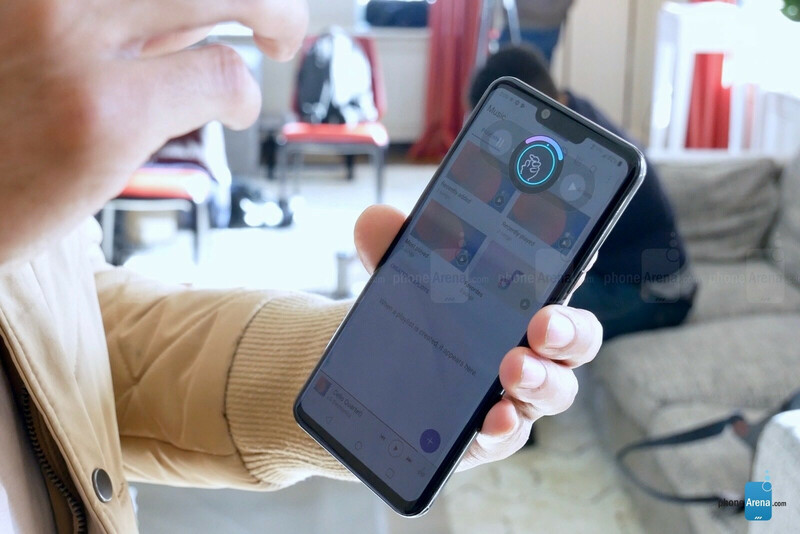 But an Android fan that goes with an LG G8 ThinQ will definitely have a handset to be happy with. Of course, we do still want to take the new phones through their paces. Stay tuned for a full-scale review when we get our hands on retail units! iPhone lover above. The LG smartphones have a much smaller notch or bite mark. That is because LG has better time of flight front facing camera. It's camera can map out everything it sees. Apple FaceID camera setup can only map out a face using 30,000 point, and that is it. LG's time of flight camera is also going to be used for air gestures, without touching the display. It can even give you much better AR capabilities. 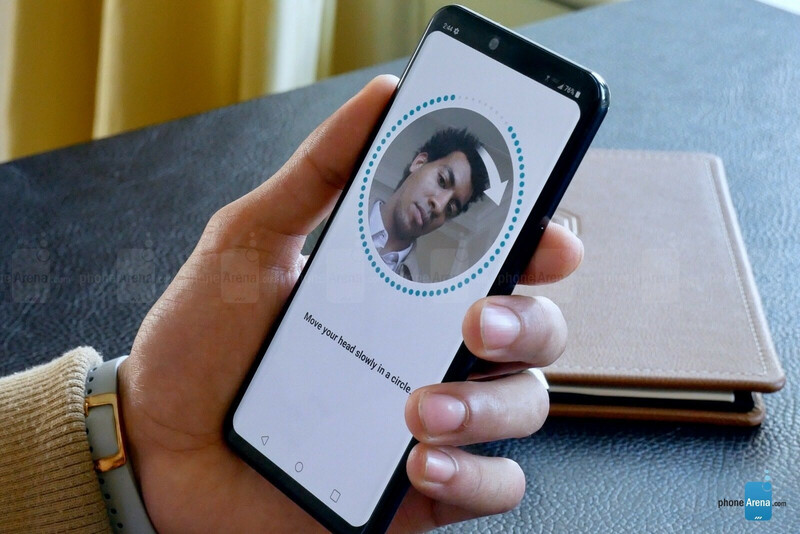 Why do you think Apple is dropping their current FaceID and going with LG's time of flight camera system instead. iPhone hater above. The LG has a large chin and a notch or bite mark. That’s because LG still defaults to a fingerprint sensor in the back to sign you in. Air features is tried and tried again - it’s still more practical to have to touch the screen as well as hard press for context. Where did you get that Apple is dropping their Face ID - I know many (including me) that love Face ID and would never go back to FP sensors - especially have effortless it is when using Face ID beyond unlocking phones: website/apps sign in, password fill, information fill, displaying information on lock screen only to you and no one else - without touching the device - that last one alone is better than having to hover your hand over the device just to have it display something - on iPhone X, you just look at it. Man get your hater head on straight. You comment so much in iPhones that we can all mistake you for fan. The LG G8 also has the 3 camera variant as well. Honestly it looks too much like a iphone. People that want Android don't want a iphone knock off. Samsung did a much nicer job with the S10 and S10 plus. The S10 and S10 plus look like a step ahead. Look at the dull display on the LG though. Looks washed out and lifeless next to the XS. They really need to step up their oled tech or at least use Samsung's offerings to even have a chance at competing. They shouldn't released v50. Maybe better with a name as G8x or G8+ since it doesn't offe greater than G8 and for the purpose of after 6months sales and feedback at least they can launch better with V series. The extra screen is just a accessory.